L-norvaline is an amino acid, it's rather uncommon and most sources are synthetic, but it does occur naturally. It's an isomer of the branch chain amino acid valine, but norvaline is a non branched amino acid. If you aren't sure what that is, don't feel alone... it's a pretty complex subject, but we're going to give you a simple and to the point explanation. In order to understand the benefits of L-norvaline, you need to have some general background information on the nitric oxide (NO) cycle. As you can see in the graphic on the right, arginine is required for the production of NO. What does all of this have to do with l-norvaline? It's simple... L-norvaline blocks arginase from breaking down arginine. In turn, this allows the arginine to get broken down by NOS, which ultimately leads to a greater rate of conversion to NO. It's this reason that norvaline makes an excellent addition to arginine supplements. You can think of norvaline as the guard dog protecting your arginine from getting broken down into urea. Due to it's inhibitory effect on the synthesis of urea, over time l-norvaline can cause an ammonia buildup. The good news is, these effects can be negated by another NO booster, citrulline. Citrulline has been proven to be extremely effective at clearing ammonia from the body. [9,10,11] As mentioned above, it provides an even greater boost in NO synthesis. You can read more on our citrulline page for more information. Be careful if you are going to use l-norvaline as a standalone supplement. If you decide to go that route, you'll need to have a strategy in place for preventing an ammonia build up. L-norvaline is a potent compound with a lot to offer, however, you have to use it wisely. You can greatly increase both the safety and efficacy of l-norvaline when you stack it with arginine, and citrulline. It will work hand-in-hand with your arginine supplement, protecting it from getting broken down into waste - thus increasing the rate of nitric oxide synthesis. 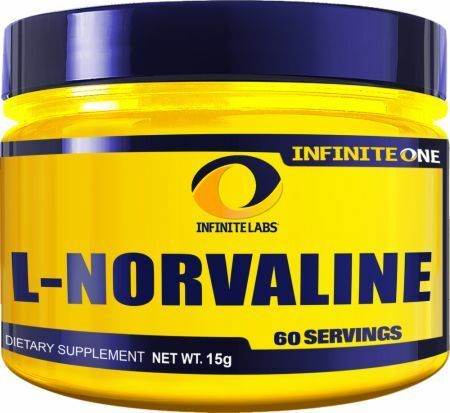 The citrulline will lend further support to the synthesis of nitric oxide, while simultaneously counteracting the ammonia buildup brought on by l-norvaline.